How many of you have experienced this scenario? Your 2 year old has gotten hold of your smartphone and you have looked all over the house for it. As you search high and low, you decide to take a look in the bathroom. Lo and behold, there it is sitting in the bathtub as it was the toy that was used in the latest bath. Maybe it you found it in the camode or even in the sink, but wherever you found it, it is now soaking wet. It has been suggested many times that if you run into this situation that you should take your device and place it into a sealed bag of rice. The rice is supposed to dry out the air as well as anything that is in the sealed bag with it. In the Bheestie bag, there are what is known as molecular sieves which act the same way the rice does. Their function is to draw the wetness of not only the bag, but whatever is put into the bag with it. It is really easy to use so you won't have any trouble trying to figure out what to do with it when you get it. 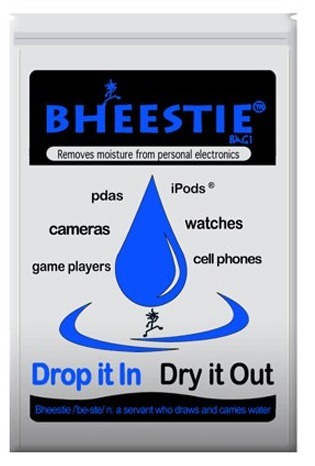 You'll take your smartphone or whatever you are trying to dry out and if you can take out the battery. Take the device and put it into the bag and close it up. Make sure that it is tightly sealed. It is best to leave it in there for at least three days, but just remember that the longer it stays in there the more moisture will be taken out. You must leave it in there for at least 24 hours and you must make sure that the bag is tightly sealed. If you are wondering if it works, go and take a look at the website testimonials. If you want to buy it, it can be purchased from the Amazon website. 0 Respones to "The Bheestie Bag"